You have a concurrent show at The Growlery. 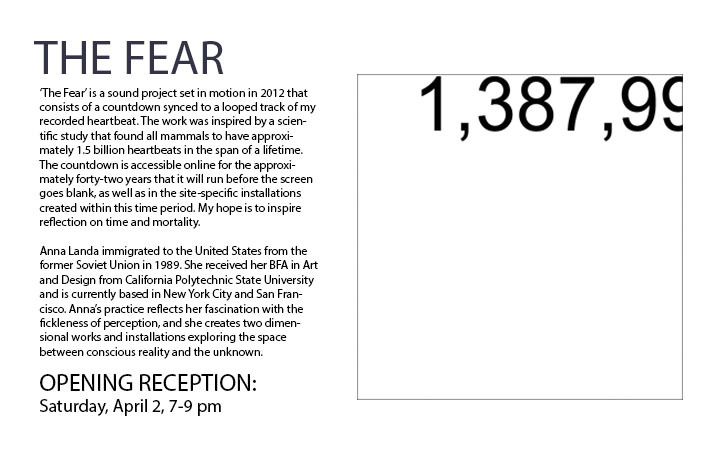 How does the body of work there relate to The Fear at Savernack Street, and would you suggest visitors see one before the other? There’s no specific need for one show to be seen before the other. More recently I’ve begun experimenting with creating projects across a variety of mediums, and ’The Fear’ was my initial crossover into sound and installation work. The Growlery show will include two installations (one interactive, the other site-specific), and two large-scale photographs. Though visually diverse, these pieces and the work at Savernack Street are unified by the underlying concepts I’m attempting to communicate. How/why did you record your own heartbeat for The Fear? The project is an intimate reflection of my personal struggles with the concept of nonexistence, hence my own heartbeat. I was also excited by the idea of abstractly digitizing my existence — what if my online presence out-lives my physical being? It’s not essential that a viewer realize it’s my heartbeat, perhaps even detrimental. Each person will engage with the work in his/her own particular way, and I don’t want to impose my perspective more than necessary. Why the palm/ tarot readers at the opening? I want there to be another point of interaction, in part to offset the heavier premise of the sound piece. In this way, I hope to offer an alternative perspective to my more stark approach and to incite a conversation around the various points of view regarding mortality. How does the geographic location of your birthplace inform your art practice? I hadn’t realized until my mid-twenties just how heavily influenced I was by my family’s experience of living in the Soviet Union. We immigrated to the United States when I was young, but I was raised with and still carry the overwhelming anxiety that I mistook for an ordinary state of existence growing up. This weight has and continues to shape me as I become more aware of certain nuances in my behavior. Investigating the similarities and differences between myself and the people around me—really getting into the meat of it—has never ceased to fascinate me. Can you tell us something about your art process in general? It’s continuously shifting, and I let it take its own course without attempting to rein it in to a particular style or format. I feel strongly about not repeating myself and work toward uncovering a new process, skill, or idea even if it results in failure. You proposed this piece to Savernack Street unsolicited and spoke of being inspired by the site. What about that first encounter triggered you to make work specifically for this gallery? I immediately fell in love with the format — I thought ‘what a brilliant idea!’. And not solely as a clever commentary on the lack of affordable art spaces in the city, but as a unique platform that set specific constraints within which to create work. It’s the limitations that drive (force, even) creative thinking and my favorite conditions to work under.